With the funds raised by Zooneyfest (www.zooneyfest.com), Team Gleason was able to be a part of sending Susan Speranza on an unforgettable trip to see her son. This would not have been possible without the wonderful people at Zooneyfest, especially Jared Bowling. Thank you for making this happen and for including Team Gleason. Please read the below letter from her son, Julian. First and foremost, thank you. Thank you with all my heart! Without your organization and the help of Zooneyfest, the amazing and memorable experience I am about to describe would not have been possible. My mother was diagnosed with ALS almost 4 years ago and she is a shining example of how a positive attitude can make the most unbearable disorder, bearable. But unfortunately after I completed my training in medical school, I began working in a hospital 5 states away and more than 700 miles from her in New York. I am a neurology resident physician and I am on the forefront of ending this horrible disorder once and for all. Like most physicians, I have a busy schedule and am not able to enjoy as much time as I would like with my mother. Up until last week, my mother had yet to see my beautiful new home and city in South Carolina. That is when with the help of Team Gleason and the Zooneyfest organization from NY, my mom’s one and perhaps last wishes became a reality. My mother took a direct flight with her identical twin Sandy (who is not affected by ALS), caregiver Michele, and son Aaron to my new home town of Columbia, South Carolina. We were able to spend some quality time together here in Columbia; she was able to see the hospital I worked in and we were able to enjoy some excellent dining before we headed to the beach. 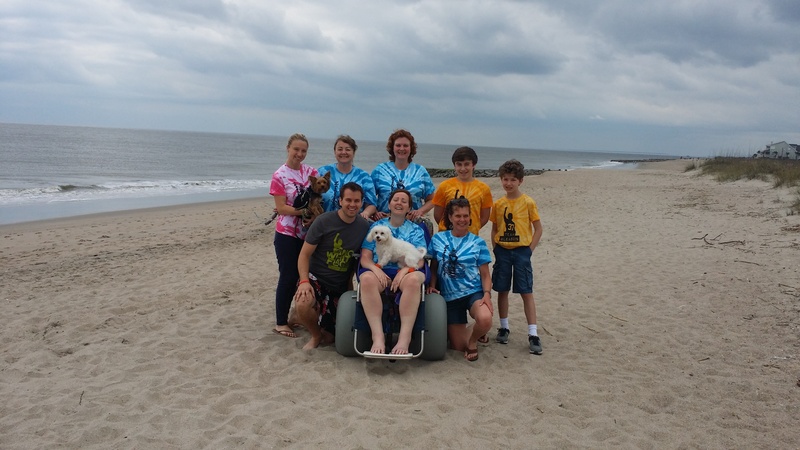 At the beach, my mother was able to see the beautiful ocean and dip her feet in the sand thanks to the customized wheelchair provided by the local fire department. We had such a great time and I could just talk for hours about the fantastic time we had. My mother, aunt, caregiver and son had a blast and so did my fiancée and I! Thank you again for everything you did and for everything you do on a daily basis to support the cause. I am confident that in the very near future, we will end ALS! Son of the bravest and most inspiring mother, Susan Speranza!